Explanation: Stars are forming in dark, dusty molecular cloud LDN 988. Seen near picture centre some 2,000 light-years distant, LDN 988 and other nearby dark nebulae were catalogued by Beverly T. Lynds in 1962 using Palomar Observatory Sky Survey plates. Narrowband and near-infrared explorations of the dark nebula reveal energetic shocks and outflows light-years across associated with dozens of newborn stars. But in this sharp optical telescopic view, the irregular outlines of LDN 988 and friends look like dancing stick figures eclipsing the rich starfields of the constellation Cygnus. From dark sky sites the region can be identified by eye alone. 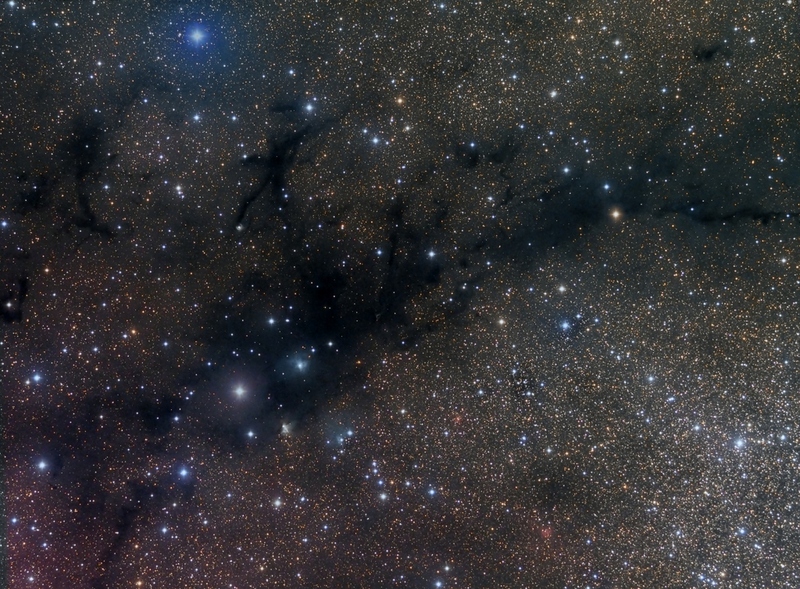 It's part of the Great Rift of dark nebulae along the plane of the Milky Way galaxy known as the Northern Coalsack.